The caskets were open, a mirror inside. Four black and white photographs smiled above each. They were four little girls, none older than 14. 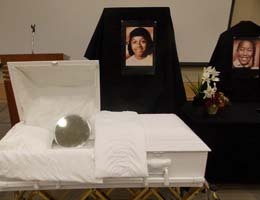 As part of Black History Month, Tidewater Community College’s Portsmouth Campus presented “Why Do They Cry,” a remembrance for Addie Mae Collins, Denise McNair, Carole Robertson and Cynthia Wesley, teenagers killed in the 16th Street Baptist Church bombing in Birmingham, Ala., in 1963. The program was designed by Student Government president Louis Gibbs, whose intent was to produce a message with a lasting intent. “The families,” portrayed by staff from Provost Michelle Woodhouse’s office and Student Government members, took their seats as a funeral dirge set a sobering tone. Soloist Rebecca Richardson sang the ballad God Help the Outcasts, and Martin Luther King Jr., via recording, delivered the eulogy. And so today, you do not walk alone. You gave to this world wonderful children. They didn’t live long lives, but they lived meaningful lives. Their lives were distressingly small in quantity, but glowingly large in quality. And no greater tribute can be paid to you as parents, and no greater epitaph can come to them as children, than where they died and what they were doing when they died. The program ended with uplifting words from speaker Jerry Gaines, a track and football athlete who was the first African American to attend Virginia Tech on a full scholarship. A Spanish teacher at Western Branch High School, Gaines led the school’s cross country team to eight consecutive district titles and three regional championships. He reminded students to consider “the choices, choices and more choices” they make and urged administrators to stress significance along with success.